Indian Economy has been in turmoil over past 3 years. Global as well and local factors have taken its toll and we are currently looking at one of the slowest growth rate in past 10 years. Indian Govt today released “Economic Outlook 2013-14” that estimates how India may perform in financial year 2013-14. 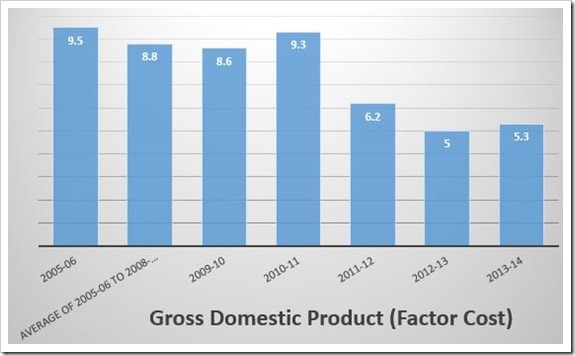 Before we look at some of the highlights of the document, here is a look at how Indian Economy has performed over past 8 years. Indian GDP is expected to grow at a modest rate of 5.3 percent as compared to 5 percent in 2012-13. This number would have been much lower had it not been for good monsoons this year. Agriculture is projected to grow at 4.8 percent, the best growth since 2010-11. Agriculture is the biggest contributor to India’s Economic growth. Last year it grew by 1.9% and 3.6% in 2011-12. Good growth in Agriculture is the sole reason why Economy is expected to log better growth than last year. Industrial growth is expected to be better than last year growing at 2.7% in 2013-14 as against 2.1% in 2012-13. Manufacturing sector projected to grow at 1.5% in 2013-14 as against 1 % in 2012-13. Services has slowed to 6.6% in 2013-14 as against 7.1% in 2012-13. This is the slowest growth rate in last 10 years. 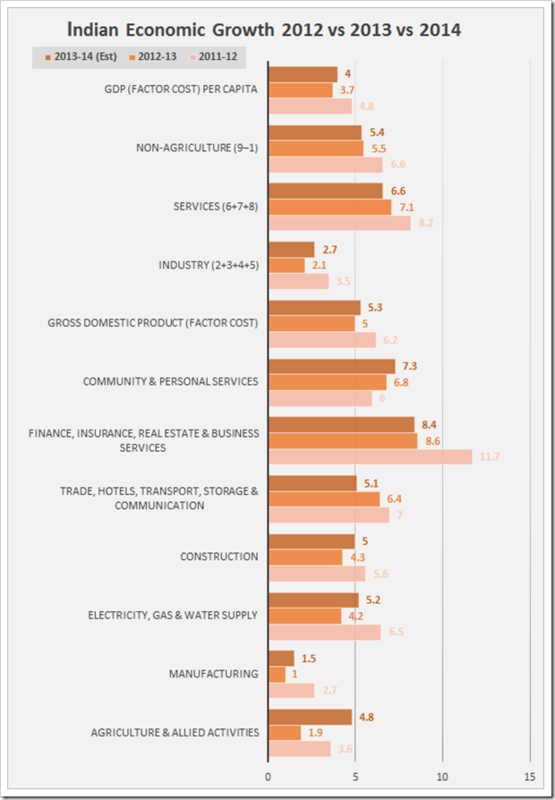 Prior to 2010-11, services logged an average growth rate between 9.5 to 10 percent. Investment rate projected at 34.7% of GDP in 2013-14 as against the estimated 35% in 2012-13. Domestic savings rate projected at 31% of GDP as against the estimated 30.2 % of GDP 2012-13. Inflation by end March 2014 is expected to be around 5.5 percent as against the average of 7.4% in 2012-13 and 5.7% at end March 2013. Current Account Deficit is expected to reduce to USD 70 billion (3.8% of GDP) in 2013-14 against an USD 88.2 billion (4.8% of GDP) in 2012-13. The center also expects that The Current Account Deficit may go even below USD 70 billion, if the recent trends in exports and imports are maintained through the year. Net FDI inflows in 2013-14 projected at $21.7 billion against an estimated $19.8 billion in 2012-13. FII inflows are estimated to reduce drastically to USD 2.7 billion in 2013-14, as against USD 17 billion in 2011-12 and USD 27 billion in 2012-13. Net Capital flows projected at $ 61.4 billion (3.4% of GDP) in 2013-14 against an estimated $ 89.4 billion in 2012-13, the second highest level to date. Budgeted fiscal deficit is estimated at 4.8% of GDP in 2013-14, as against an estimated 4.9% in 2012-13. On the whole, Indian economy is expected to do better than last year, but it is still much lower than average growth rate of previous 5 years. 64-bit Processors On Mobile – Do Others Need To Take The Plunge?